I want to pass on a bit of commentary by Robert Sapolsky, in a special issue of Nature Neuroscience that focuses on stress, that presents a clear and lucid description of "good stress" and "bad stress." ...to a large extent, the effects of stress in the brain form a nonlinear 'inverted-U' dose-response curve as a function of stressor severity: the transition from the complete absence of stress to mild stress causes an increase in endpoint X, the transition from mild-to-moderate stress causes endpoint X to plateau and the transition from moderate to more severe stress decreases endpoint X. A classic example of the inverted-U is seen with the endpoint of synaptic plasticity in the hippocampus, where mild-to-moderate stressors, or exposure to glucocorticoid concentrations in the range evoked by such stressors, enhances primed burst potentiation, whereas more severe stressors or equivalent elevations of glucocorticoid concentrations do the opposite11. This example also demonstrates an elegant mechanism for generating such an inverted-U12. Specifically, the hippocampus contains ample quantities of receptors for glucocorticoids. These come in two classes. First, there are the high-affinity low-capacity mineralocorticoid receptors (MRs), which are mostly occupied under basal, non-stress conditions and in which occupancy increases to saturating levels with mild-to-moderate stressors. In contrast, there are the low-affinity, high-capacity glucocorticoid receptors (GRs), which are not substantially occupied until there is major stress-induced glucocorticoid secretion. Critically, it is increased MR occupancy that enhances synaptic plasticity, whereas increased occupancy of GRs impairs it; the inverted-U pattern emerges from these opposing effects. ..in general, the effects of mild-to-moderate stress (that is, the left side of the U) are salutary, whereas those of severe stress are the opposite. In other words, it is not the case that stress is bad for you. It is major stress that is bad for you, whereas mild stress is anything but; when it is the optimal amount of stress, we love it. What constitutes optimal good stress? It occurs in a setting that feels safe; we voluntarily ride a roller coaster knowing that we are risking feeling a bit queasy, but not risking being decapitated. Moreover, good stress is transient; it is not by chance that a roller coaster ride is not 3 days long. And what is mild, transient stress in a benevolent setting? For this we have a variety of terms: arousal, alertness, engagement, play and stimulation (Fig. 1). The upswing of the inverted-U is the domain of any good educator who intuits the ideal space between a student being bored and being overwhelmed, where challenge is energized by a well-calibrated motivating sense of 'maybe'; after all, it is in the realm of plausible, but not guaranteed, reward that anticipatory bursts of mesolimbic dopamine release are the greatest19. And the downswing of the inverted-U is, of course, the universe of “stress is bad for you”. Thus, the ultimate goal of those studying stress is not to 'cure' us of it, but to optimize it. Figure 1: Conceptualization of the inverted-U in the context of the benefits and costs of stress. A broad array of neurobiological endpoints show the same property, which is that stress in the mild-to-moderate range (roughly corresponding to 10–20 μg dl−1 of corticosterone, the species-specific glucocorticoid of rats and mice) has beneficial, salutary effects; subjectively, when exposure is transient, we typically experience this range as being stimulatory. In contrast, both the complete absence of stress, or stress that is more severe and/or prolonged than that in the stimulatory range, have deleterious effects on those same neurobiological endpoints. The absence of stress is subjectively experienced as understimulatory by most, whereas the excess is typically experienced as overstimulatory, which segues into 'stressful'. 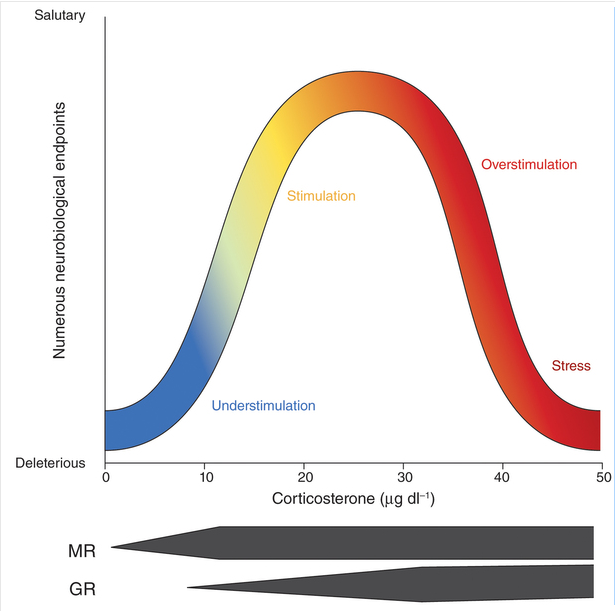 Many of the inverted-U effects of stress in the brain are explained by the dual receptor system for glucocorticoids, where salutary effects are heavily mediated by increasing occupancy of the high-affinity, low-capacity MRs and deleterious effects are mediated by the low-affinity, high-capacity GRs.